Anzac Day is a great time to commemorate the amazing work of Australian soldiers who have fought for our country. However we can’t forget the help and support of the Defence Force animals, whose natural talents and instincts have significantly assisted soldiers at war. These amazing animals including dogs, donkeys and pigeons have used their skills to detect explosives, track movements, send messages, transport soldiers in need, as well as providing companionship and support for soldiers faced with extreme and sometimes lonely circumstances. 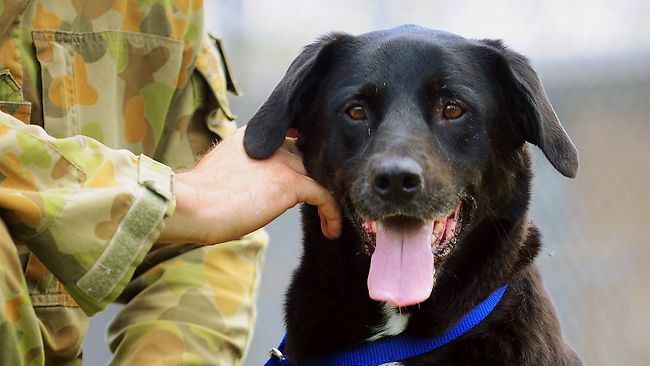 So to coincide with Anzac Day, here at Jetpets we are celebrating not only the men and women who have served our country, but the animals who have performed extraordinary tasks in the Defence Force. One of Australia’s most celebrated dog heroes is Sarbi, who worked with the Defence Force as an explosive detection dog in Afghanistan. She was serving as part of the Australian Special Operations Task Group in 2008 when Australian troops were injured in a stand off. Sarbi was lost in the battle and feared dead, however 13 months later was found by a US solider on patrol nearby. Due to her bravery and persistence to never give up despite being lost, Sarbi was awarded the highest military honour for animals, the RCPCA Australian Purple Cross, as well as the War Dog Operational Medal and the Canine Service Medal. One of the most well known stories of the First World War is that of Simpson and his donkey, who were often seen singing and whistling whilst transporting wounded passengers. Simpson and his donkey were credited with saving over 300 lives in Gallipoli by escorting men from the front line and carrying them back to safety. In the Second World War, Horri the dog played a pivotal role in saving many lives, thanks to his uncanny ability to sense an incoming aircraft. As an enemy’s aircraft was approaching, Horri’s ears would prick up and he would let out a massive growl signalling for soldiers to safely retreat to their trenches. Back in 1966, a black Labrador named Caesar accompanied his handler Peter Haran in South Vietnam with the task to track active operations in combat zones. During a particular mission with his handler, a group of soldiers and Caesar himself came up to an intersection. Caesar charged ahead, only to quickly stop and return to his handler Peter Haran and sit on his feet. Haran was confused by this strange behaviour and paused, while another nearby solider walked ahead only to stand on a mine, being severely injured in the process. Although Caesar had never been trained to detect mines, his instinct told him to sit on the feet of his handler so he and the rest of the troops didn’t walk any further, saving all of their lives. During the First and Second World War, pigeons were often used as military messengers due to their homing ability and speed. One pigeon named ‘The Mocker’ flew 52 missions before he was wounded, transporting key messages to allied troops and in turn saving the lives of many.